Falling Water: A Flyout that wasn’t! If I were asked to name my second passion, I would have to say it is Architecture. With a sister studying Architecture, I grew up surrounded with designs, drafting, discussions on famous architects such as Louis Sullivan, and Frank Lloyd Wright and The Fountainhead. In my spare time I pored over my sister’s books with flashy images of buildings from around the world; mesmerized by the intricate designs, lofty skyscrapers and flowing structures that could only be imagined and executed by the intellect of man. 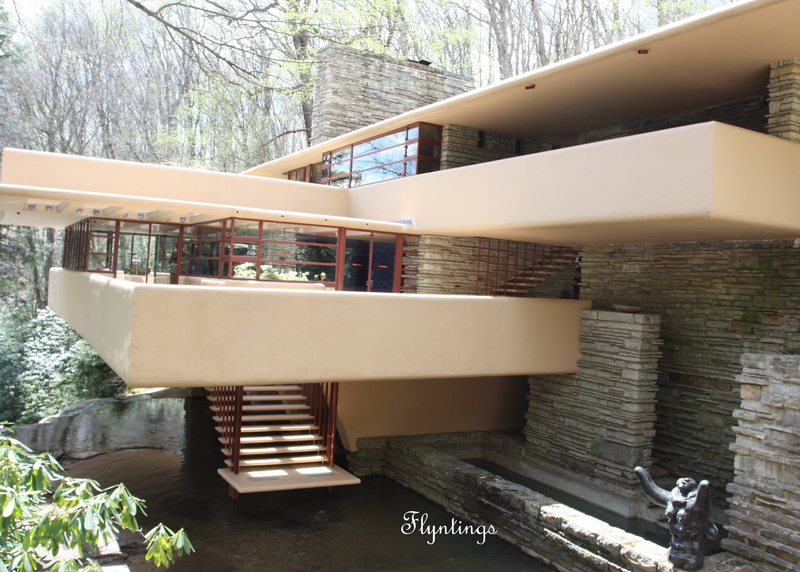 Falling Water is a masterpiece by architect Frank Lloyd Wright (FLW). 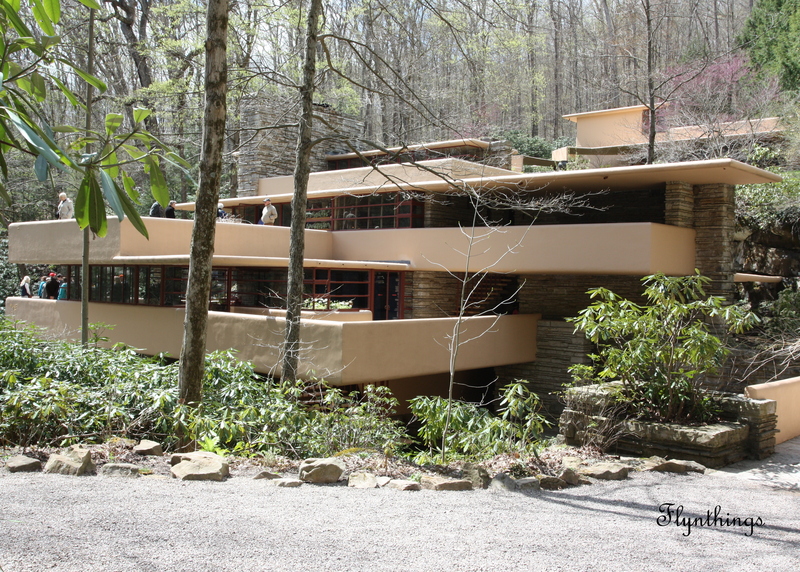 Nestled in a valley in rural Pennsylvania, away from civilization, it is one of the most enduring buildings designed by FLW that propelled him to fame and success. It was built for the Kaufman family in the 1930s as a weekend home and is now preserved by the Western Pennsylvania Conservancy and open to the public as a museum. One enters the house into a large room designed using open architecture. The room is sectioned creatively into a living area, study area, and dining area. Rustic walls built with stones, rocks protruding by the hearth of the fireplace and sheet of glass windows providing unlimited vistas, all integrate the building most effectively with the striking natural surroundings. Even the glass windows are designed to provide uninterrupted views of the outside. Gentle sounds of the falls permeate inside the house. 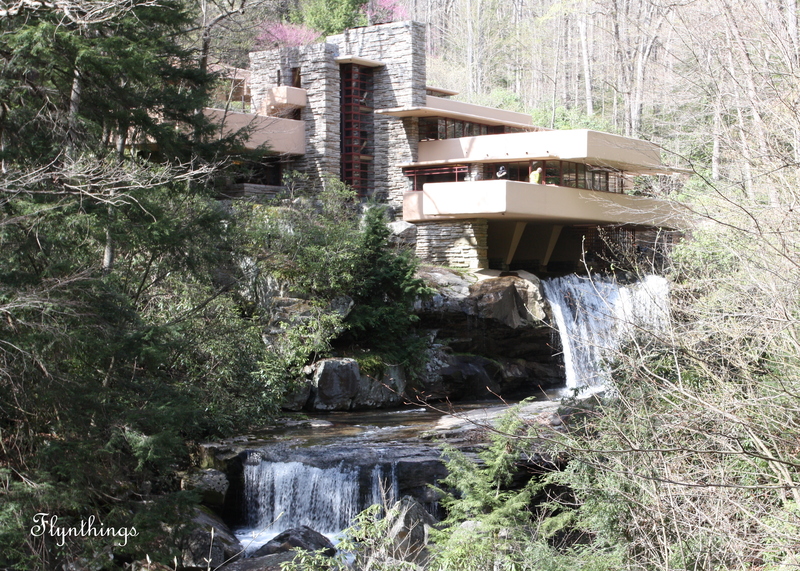 While inside looking out provides breathtaking views of the outside, Falling Water is best viewed from the outside. Like a painting or a sculpture, it is best admired from a distance. Walk the short distance, to the clearing in the woods to glance and admire the building: sitting gracefully on a rock ledge atop a waterfall, carved into the earth in layers, gently rising over the face of the mountain with cantilevered terraces blending with the rock formations. One with nature: where man-made beauty collides with natures beauty. I have visited many FLW built homes in Illinois, Wisconsin and California, but none matches the beauty that is Falling Water! They say third times a charm. But not this time. For the last three years, I have been planning a flyout to Joseph A. Hardy Connellesville airport (KVVS) in Connellesville, PA , the nearest public airport to visit Falling Water. Each year the weather has spoken otherwise. It almost looked like we would make it this year. The cold front and severe weather had rolled through the night before. It was expected to be partly sunny, cooler and windy. And we almost made it. Almost. Pre-flight done. Aircraft fueled. Lucy even got in the back seat, while Linda and I did last minute checks. We had pored over the weather, checking winds, turbulence, freezing levels and IFR conditions. It was windy and we expected it be bumpy. “The winds don’t look good, are you okay with it?” Lucy asked me. As PIC, decision time was here. Running into Mike (a CFI at the flight school) earlier when I arrived, I had asked him if he had flown yet, to get a feel for the weather. We looked at radar images on the big screen, seeing the wavy patterns trailing from the west to the east. Definitely turbulent! Walking back into the terminal building to check the weather one more time, Linda and I cornered Mike again to help us make our decision for go/no go and to reconsider if we were doing the right thing heading out into the turbulent skies. He could only give his opinion, but ultimately the decision had to be made by us. One final call to Flight Service and even before we were done we knew it was best to cancel. Ever enthusiastic, Lucy said: “Let’s drive there, I can drive us”. Third year in a row, I couldn’t pull off this flyout. Maybe it is best, since the whole planning was proving to be too complicated. The only nearest car rental company was Enterprise and they only operate from 9 -12 on Saturdays, short staffed and unable to pick us up at the airport or leave the car at the airport for us. VVS did not currently have a courtesy car, but the airport manager was happy to drive us to Enterprise if we got there before noon. And then the whole question of what do we do in the evening when the time came to return the car back at Enterprise and get back to the airport was still unanswered. Driving three hours, through scenic Virginia, Maryland and Pennsylvania, with two pilots and one of whom happens to be an architect was the best hangar driving experience 🙂 Talking planes and buildings especially FLW, the three hours swept by unknowingly. The earth was just starting to awaken from the stark winter, with splashes of color, shades of purple here, dashes of bright yellow there, emerging green in the trees, and intricate rock formations in the mountain sides vividly visible now but would soon be lost amid the green foliage as summer advances. Almost eighteen years ago, I had made a similar road trip with my architect sister driving from New York out to the backwaters of Pennsylvania to Mill Run to get a glimpse of Falling Water. It stood then as it did now: Elegant. Pristine. Perfect. 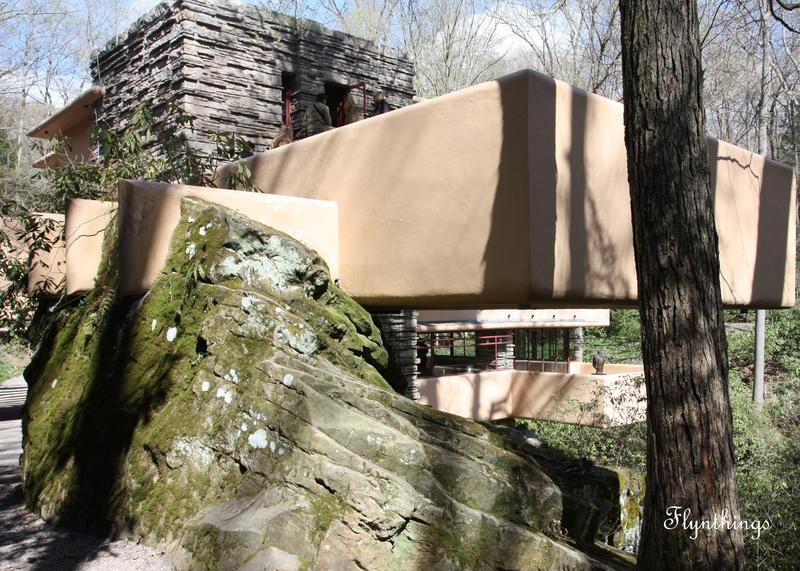 A testament to the creativity of FLW and of mankind in general. Thanks for a great post and photos! I’ve always wanted to visit this place, along with Wright’s original Taliesin in Spring Green, Wisconsin, and the conference center he designed in Madison. You need to see his Taliesin West in Scottsdale, when you come to check flying the Grand Canyon off your bucket list! Best time to visit Taleisin East is during a visit to Oshkosh, which I was fortunate to do so back in 2002.